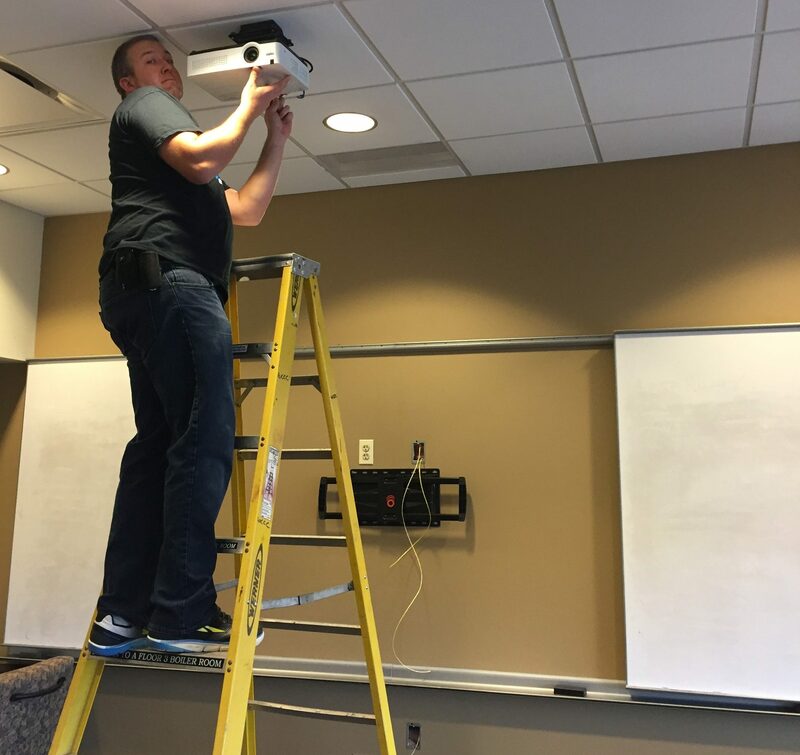 Many of our conference rooms and classrooms around Willow have aging 4:3 SD projectors and wall plates fitted with VGA inputs from times gone by. We’ve been swapping out these projectors and VGA infrastructures with wall-mounted TV’s that are fitted with HDMI infrastructure. Each time we install another TV, something pops up that helps us learn something new. Here are a few things we’ve picked up along the way. Start with understanding the needs of the end user. Ask questions: What will be the primary purpose of this setup? What gear will help fit the user’s needs? This is the installer’s version of measure twice, cut once. Tip: We’ve found that with many conference rooms where running a physical HDMI cable to the TV isn’t ideal, outfitting an AppleTV for screen sharing is helpful (in a Mac-primary environment). Barco’s ClickShare button is a similar solution that works for both Mac and PC users but is not the ideal solution when used to play videos from the internet. Ask questions: What wall will the TV mount onto? What is the furthest viewing distance in this space? Where will cable paths land? Is there appropriate structure behind the wall to support the weight of a TV? Tip: Take pictures of the space and map out digitally where boxes should go for internal cable runs using Photoshop or an app that can easily draw on top of pictures, like Jing. Wondering if a TV will be big enough or if the space will match the TV size? Crafting a quick paper or a foam mock-up that is the size of the TV you’re wanting to install can help with determining what TV will be best. Based on what the users need, how many inputs will be needed? Tip: Around here, we pick LG and Sharp for our displays. LG has a commercial line that is intended for long use periods and has longer warranties. Sharp has had TV’s in the larger 80”-90” range that suit some of our room needs. Based on the weight of the TV and the potential maintenance needs of the space it will be installed in, select a mount. We have landed with using Peerless mounts for static installs and Echogear mounts for areas where we need the TV to be able to telescope out. We’ve stayed away from super low profile mounts, as they make maintenance difficult down the road. Tip: If you’re installing an AppleTV, consider mounting it on the back of the TV for simplicity of install and cable runs. We prefer to use the Total Mount. Try to get the right sized cables before your install to minimize excess cable that will later need to be managed once the gear is installed. If you’re going to be running cables through walls, consider getting locking HDMI cables. If you need custom wall plates made, Panel Crafters by Liberty AV Solutions does a great job for us on a consistent basis. Tip: Monoprice is a great place to purchase cables! They have a line of slim HDMI cables that work well for installs. The only downside – this cable doesn’t pass 4K signal at this point. Buying TV’s through a vendor rep provides an extra level of customer service should issues arise (ABT, Best Buy Business, AVI Systems). Tip: Adding in some basic stock for unknown issues is really helpful. Purchase a few right angle adapters for RF cables, HDMI cables, power cables, or any other connections that may pinch up against the wall or TV. Every installation is different. Keep it as clean and simple as possible. Make sure you’ve got a pencil, stud finder, level, drill, and hex-head bolt bit (for lag bolts). When setting up an Apple TV on a public or staff network, make sure to configure the “AirPlay” settings for conference room mode. This will always ask the user to put in the code that is shown on the in-room screen. This will ensure your AppleTV can’t be “hacked” inadvertently by someone outside of the room who accidentally connects to the device because they are on the same wifi network. Set the TV’s picture mode to “Just Scan” or “Dot by Dot”. This will ensure that the output will have the correct aspect ratio and fill the screen based on the input settings. Label the inputs of the devices you have installed. Give the input a name instead of “HDMI-1”. This will help the user better know at a glance which input will show their intended content source. Disable the inputs which are unused by the devices that you have installed. Often times this is called “input skip”. In a public display setting (like a lobby area or an information kiosk) you can disable certain features on the TV to alleviate future issues. Here are some common settings that can be disabled using a manufacturer service remote. “On Screen Display (OSD)” so that input change information is not seen. “Key Lock” so that the local buttons on the display do not change the settings. “IR Lock” if you are having issues with people changing the TV settings. “Volume Limit” you can even disable the volume from a display if it is not needed. Tip: When pulling cables through walls, pull an additional pull line with your cable so you’ve always got a quick way to add cables in the future. Adding TV’s to spaces can greatly enhance the user’s experience – especially when compared to projection. Don’t forget to do every step with your end user in mind – create operating instructions if your system has any complicated steps, and make sure to leave the space better than you found it. As they say…A clean install is a happy install…or something like that. FAQ: What is Willow Creek’s Audio Volume Policy?